Grant County is home to thousands of acres of flat, seismically stable and affordable land ripe for industrial development. Minimal population density throughout the county makes for an ideal flight testing environment, while proximity to major transportation hubs like I-90 and the Grant County International Airport position the Port well for distribution and transport. Washington’s public utility district provides wholesale telecommunications services utilizing a fiber optic system with internet speeds up to 100mbps. The PUD utilizes a fiber optic network, as opposed to less reliable copper cables since glass fibers are less susceptible to electrical interference. The Port of Moses Lake operates a land application based Industrial Wastewater System. This system currently serves six industrial clients. The Port receives effluent from clients through a gravity collection system to a central transmission station where it is sent under pressure to one of the two lagoons. The Port has storage capacity for 59 million gallons. The Port applies this stored water onto a forage crop during the summer months. In order to further the Port’s services to current and future clients, the Port is looking to expand its operations in 2017 into either a Reverse Osmosis (RO) and/or a Membrane Bio-Reactor (MBR) system. With this enhancement, the Port should be able to accommodate any type of industrial user. 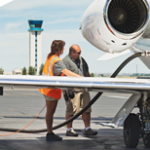 Million Air is an FBO equipped to supply Jet-A fuel for commercial, military, and personal aircraft. Million Air previously assisted in the testing of Boeing’s 747-800. Million Air provides a full range of ground support services including flight test support. Columbia Pacific is equipped to provide aircraft maintenance; fueling, and de-fueling; loading, and unloading; as well as flight testing.